Achieve has developed materials to help states, districts, and others understand the organization and content of the standards and the content and evidence base used to support the standards. In 2009, 48 states, 2 territories and the District of Columbia signed a memorandum of agreement with the National Governors Association (NGA) and Council of Chief State School Officers (CCSSO), committing to a state-led process - the Common Core State Standards Initiative (CCSSI). Achieve partnered with NGA and CCSSO on the Initiative and a number of Achieve staff and consultants served on the writing and review teams. 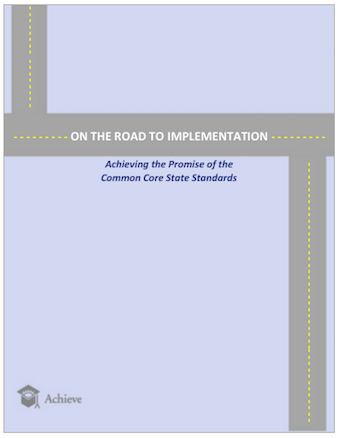 On June 2, 2010, the Common Core State Standards for English Language Arts/Literacy and Mathematics (CCSS) were released, and since then, over 45 states have adopted the Common Core State Standards and are now working to implement the standards. Achieve’s Grade-Band Guides to the CCSS and Parent Questions– Achieve developed these resources, organized by grade band, to explain the shifts occurring in students’ classrooms and illustrate concrete examples of what parents can expect their children to know by the end of each school year. The grade band documents are available for grades K-2, 3-5, 6-8, and 9-12. The accompanying questions can be shared with parents to facilitate conversations among teachers and parents about how and why learning might look different and what they can do to help.